Takes all the grease out of the equation, even the elbow kind! A car, while being a convenient form of transportation and a canvas for artists of the detailing persuasion, does create and gather quite a bit of stubborn messes. 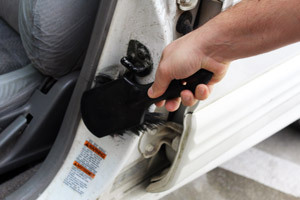 Whether it be the oil and grease build-up on in the engine compartment or the road grime and caked on mud on your undercarriage, not all messes can be cleaned with just a little bit of elbow grease. For these more stubborn and resilient messes, you need a cleaner that is capable of cutting through and breaking down those incredibly tough contaminants. BLACKFIRE Super Degreaser was formulated using highly-effective cleaner agents that are able to penetrate through types of contamination that other cleaners may fall short on. 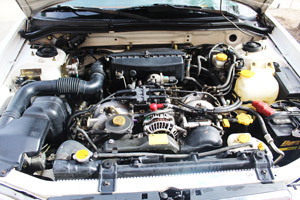 BLACKFIRE Super Degreaser also manages to accomplish such a feat faster than you would even think is possible! The proprietary ingredients used in BLACKFIRE Super Degreaser will work to not just loosen, but actually dissolve the grease and grime! 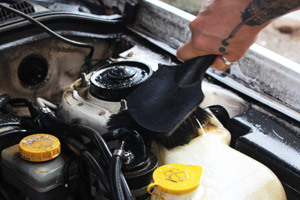 BLACKFIRE Super Degreaser, when diluted accordingly, is so powerful that only a minimal amount of scrubbing is necessary for the even the greasiest engine compartments! 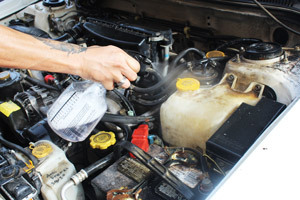 Simply spray BLACKFIRE Super Degreaser onto the surface, agitate (if necessary), and rinse away! 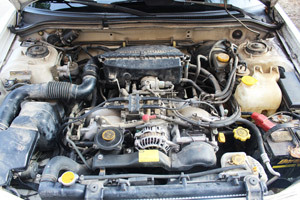 Before you know it, your once dirty engine compartment will be free of grease, grime, and dirt! Follow up with a layer of BLACKFIRE Trim & Tire Protectant to keep your trim pieces protected! BLACKFIRE Super Degreaser is quite a flexible and versatile product as well! While it is entirely capable of handling your toughest messes and contaminants, BLACKFIRE Super Degreaser can be diluted to the strength required the specific task you are working on! You will be able to handle a wide variety of job with varying contamination severity all with ONE bottle of BLACKFIRE Super Degreaser! 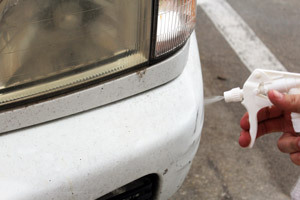 Aside from the notoriously "greasy" areas like engine, when diluted properly, BLACKFIRE Super Degreaser can be used on all sorts of surfaces - including exhaust pipes, door jambs, tires and wheels, and even on stubborn bug remains and tar on your paint! With products as strong as BLACKFIRE Super Degreaser, a lot of people worry about how it affects them and their environment. And if they were talking about some of the other degreasers on the market, they would be right to do so. 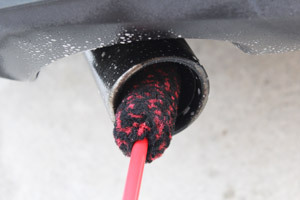 However, BLACKFIRE Super Degreaser is not formulated like the other degreasers. BLACKFIRE Super Degreaser is made using a formula that is phosphate-free, residue-free, and biodegradable, making it safe for use in all environments!